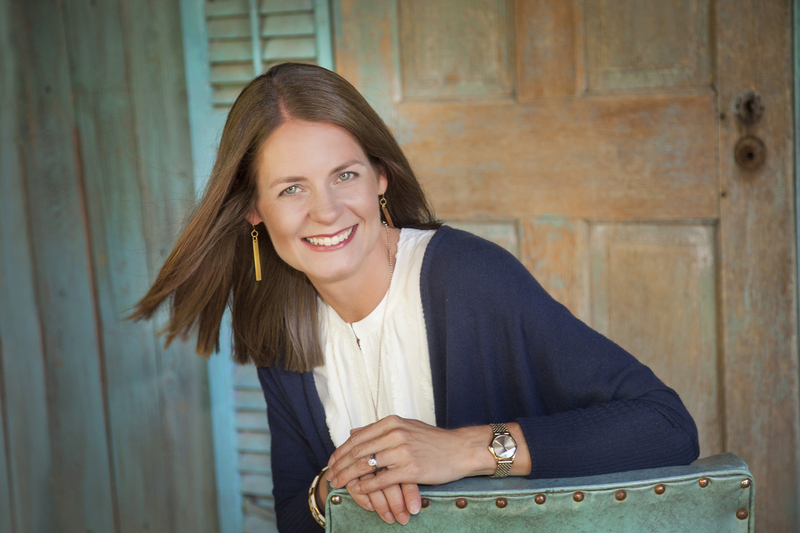 Join me in The Mom Dare with my friend, Krista Gilbert over at Meaning in a Minute. You are the difference-makers. Change agents. Heroes. What you do every day – the hugging, working, teaching, organizing, praying, carpooling, cleaning, playing, laughing, crying, serving, and giving – it changes the world by deeply impacting those right at your kitchen table. We see you. We like you. We know you – because we are also you. We are moms….and when we find some time, we also write. And we’ve gathered together as a group to bring you a dare that is just for you. Enjoy – we think we’ll have some fun together! 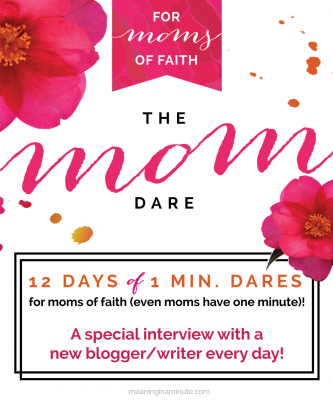 12 days of 1 minute dares for moms of faith (even moms have one minute)! 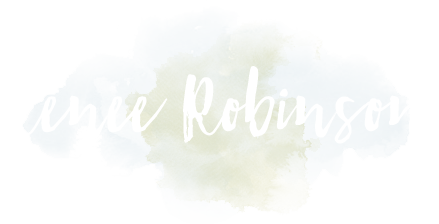 A special interview with a different blogger/writer every day. 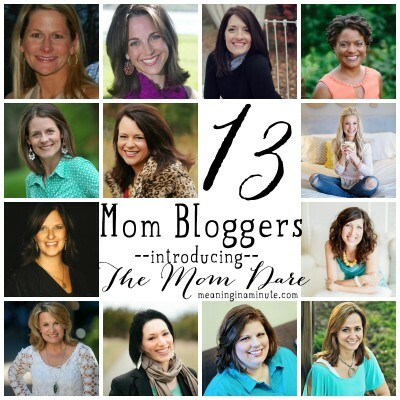 An invitation to be a part of an exclusive Facebook group for the Mom Dare where you can ask the writers questions, and receive feedback. The dare kicks off this coming Sunday, May 8 (MOTHER’S DAY!) and will run through Thursday, May 19. I will be featured on May 17th and I’d love to hear from you on that day! Sign up for the dare here! I’m sure she was expecting a complaint. After all, I was at the grocery store, not exactly a massage or pedicure. She asked with hesitation, holding her breath anticipating my response. I wanted to say more to this young man, but I knew if I opened my mouth, he might get more than he bargained for. Like a 38-year-old woman crying over realizing she is ungratefully blessed most days. Mother’s Day. If I had spent much time on Facebook, I may have been tempted to feel cheated out of “my” day. Selfish, right? 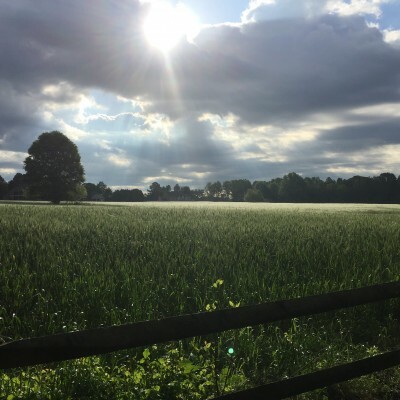 I would be lying if I didn’t admit there were a few moments I felt that twinge of jealousy that another mother was being pampered while my day felt just like every other day. That is when the Holy Spirit spoke louder. Another day of this. This life of laundry, groceries, church, baseball games, arguing, laughing, crying, tasting, feeling, moving. Life. Happy Mother’s Day! That’s the moment I understood. The celebration is in the ordinary. I didn’t need to be showered with gifts, pampered with affection, or catered to. I had this day, this life, these children. This is my gift. I thought back over the morning. Beautiful graces all morning long. A sweet note tucked in my purse from one son, another son clearing away piles from the stairs – without being asked, a husband writing me precious words and jumping to do all he could to show me he appreciates what I do. So I battled in my mind, which is where the fight for peace happens. I stilled the shouts of the world, and listened for the voice of the Holy Spirit. Surrounded by blessings almost missed. Like any other day, I’m always tempted to miss the biggest blessings right in front of my eyes. A smile, a hug, a kiss, a breath. When I took my eyes off of myself and placed them on God, my eyes were opened to the blessings in an ordinary day called Mother’s Day. Steve apologized several times for what he felt was a “not-so-great” Mother’s Day. I couldn’t disagree with him more. It was the best Mother’s Day of my life. Simply because it was an ordinary day. The gift of one more day to do this thing called mothering. And just like God, He waited until the end of the evening, after speaking into my heart, really getting into those deep places and moving me, to give me another Mother’s Day gift. A simple moment with my son. I glanced at the dishes in the dishwasher, the ones in the sink, the food needing to be wrapped, baseball clothes strewn all over the place. Grass clippings making trails through the kitchen. The mess isn’t going anywhere, but he is. He is growing up. 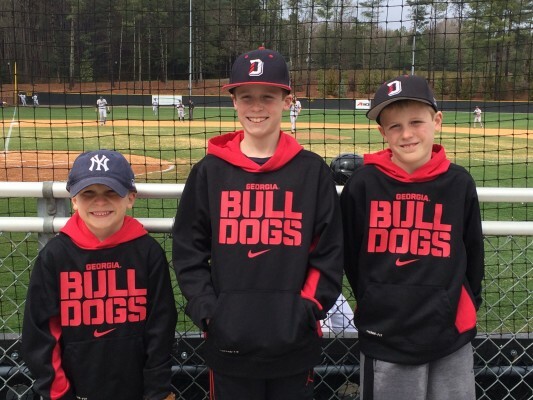 I never know when the last time I’ll hear the words “Mom, will you pitch to me?” might come. So when the invitation arrives, I will accept. I pitched, we laughed. I’m not good, and I’m scared of the ball. He’s ok with that. We sat on the driveway. An ordinary moment. The chatting began. He told story after story. I asked no questions. Just listened and laughed. No nagging, no prodding, no arguing. An absolute treasure of a gift. He heard another brother approaching, and I saw the disappointment in his eyes as he realized our private time was coming to an end. No earth shattering conversations. Just ordinary. The day was exactly the day the Lord had made. Because the day was simple, I was able to receive the gift the Lord had for me in those simple moments that I will hold onto forever. Moments that might not have happened. An understanding that wouldn’t have come. When I take my eyes off me, I see Him, and I see the gifts that parade in the dailies of my life. My mother’s day was an ordinary day, which made it the best Mother’s Day possible. 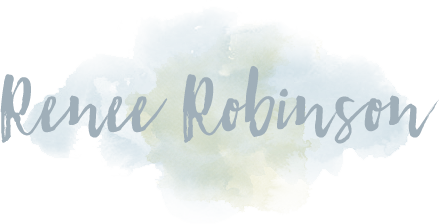 https://renee-robinson.com/wp-content/uploads/2015/05/IMG_4513-e1431441206391.jpg 400 533 Renee http://renee-robinson.com/wp-content/uploads/2017/08/ReneeGrey_03.png Renee2015-05-12 14:40:342018-05-01 15:40:52So How Was Your Mother's Day? When we were little, Mother’s Day was always a day for us to make mom breakfast in bed. 364 days of the year she was up before the rest of us. 1 day of the year she magically stayed in bed, allowing us the perfect opportunity to surprise her. Eggs scrambled a little too hard. Toast cold and a little on the burnt side. Glass of orange juice sticky from little hands doing the pouring. All arranged on a tray, maybe a little flower on the side, handmade cards telling her she was the best mom in the world. To a child a mom is their world. She is the one. The only. The everything. The one who listens. The one who wipes. The one who fixes. The one who calls. The one who laughs. The one who plays. The one who is always there. She is the one who walks into the room when they are sound asleep. And prays and pleads with God on their behalf. She is the one who behind the scenes is praising God for every aspect of their lives and boldly asking for more. More of His goodness sewn into their hearts. And yes, she even asks God to use them as mighty warriors for His kingdom, knowing full well what this may bring. She is the one who stays up later than the rest. Making that costume into the wee hours. Washing that special shirt that must be worn the following day. Cleaning up the messes that are evidence of life lived fully. Making that home one that is warm and inviting, fresh for the next morning’s awakening. Putting her special touch on life. Little lunch notes, a special light she leaves on, a special candle she burns, a special place she sits. She is the one up before the rest. Meeting with God so she can be the mom they need. Preparing lunches. Preparing lesson plans. Preparing their hearts. Paving the way for a blessed day. She is the administrator. The scheduler. The balancer of it all. Whether she works or stays home or does a little of both doesn’t matter. Because her heart is with her little ones and she does it all for them. She is the one who pours out her heart so completely into those little ones for so many years that she can hardly envision a life that looks any different. And she is the one whose heart will be ripped open wide when she realizes she is no longer their everything. Lord willing, the Lord will be their everything. They will look to Him to be their healer, their fixer, the lover of their soul. They will have been loved so well by that mama that they won’t need her to be their everything. Her role will change but the memories will remain. Her legacy will live. The pouring out of love. It hurts. The pouring out of self. It’s hard. But that is exactly how God needs it to be. When that mama’s heart breaks, He will heal it. When that mama is lonely, He will comfort. When that mama needs someone to nurture, He will bring her the hurting and the needy. When she needs to put her special touch on life, He will bring Her the ones who need a special touch in their lives. To the mamas whose babies are grown, you will always be a mama. Even when you don’t need to mama to your babies, God needs you to mama to His people. Keep pouring out for Him. And be thankful for how He has used your life to impact your children. To the mamas in the trenches, this season….well, that is all it is. It’s a season. It will pass. So grasp every single second. Sniff their sweet cheeks every chance you get. Hold them when they are too big to hold. Pray your heart out for everything you can imagine. And to the ones who desperately want to be a mama, and you wait. And your heart physically aches as you long to use the mama in your heart. That mama heart that God gave you. As you cry out to God asking for this blessing. Use that heart right now. Right where you are. Use that mama heart to love and nurture the ones God is putting in your path for this season. A mom is more than a position in the family. It’s a heart. A heart that loves. And there may just be someone who needs some of the heart that only you can give. Happy Mother’s Day a little bit early. 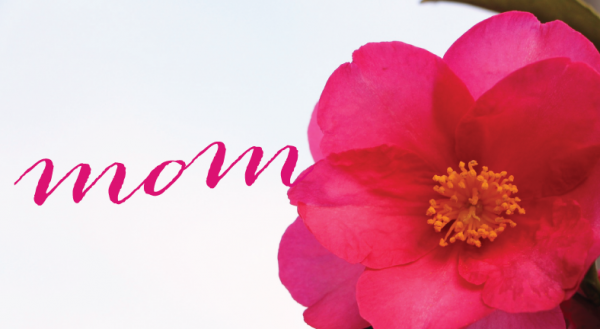 Leave a comment-Anything you want to share about Mother’s Day, your mom, your kids, favorite memory. You get the picture. Share any post on Facebook, Twitter, or Pinterest. Please be sure to comment with what you shared and where. Entries must be in by Monday, May 6th 11:59 pm. Winner announced here on Tuesday, May 7th.